The worst fumble in NFL history didn't happen on the gridiron, but rather occurred last month when Ray Rice, the Baltimore Ravens running back who was caught on camera dragging his unconscious then-fiancee out of an elevator, was "punished" with a two-game suspension. After realizing what a bogus call that was, the NFL has revamped its domestic violence policy in a noteworthy sign of progress. 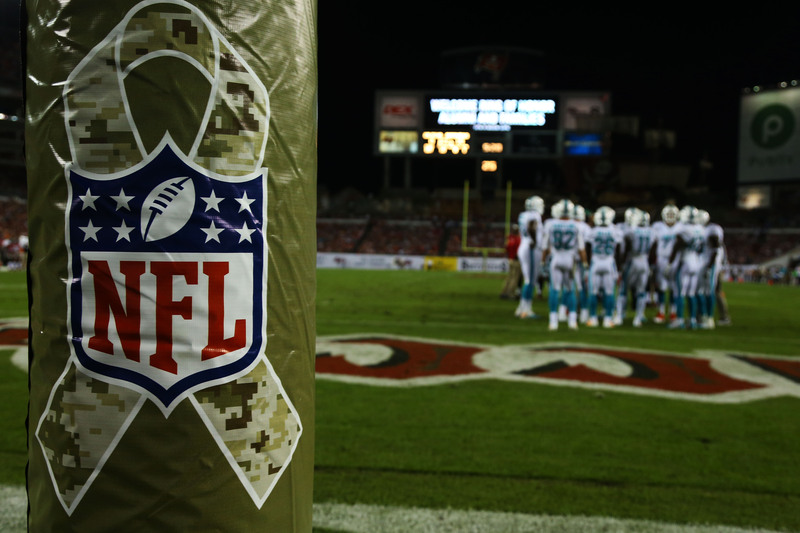 Now, finally, the NFL is taking domestic violence more seriously than smoking mairjuana. Following NFL commissioner Roger Goodell's decision in July to keep Rice out for a paltry two games (two games less than the average suspension doled out for substance abuse), he was met with immediate fury from anti-domestic violence organizations, women's groups, and most people with common sense. After all, when it was discovered that Michael Vick was involved in dog fighting, he was suspended without pay indefinitely by the NFL. As reprehensible as his crimes were, when comparing his punishment to Rice's, it seems to suggest that the NFL holds dogs in higher esteem than it holds women. But thankfully, the NFL made a solid showing of solidarity with survivors of domestic violence on Thursday, and effective immediately, players who commit "assault, battery, domestic violence or sexual assault that involve physical force" will automatically be suspended for six games without pay, if it is their first offense. Some circumstances, the new policy states, will also warrant a longer suspension. Among these compounding circumstances include prior offenses (committed before signing with an NFL team), committing an offense that involves a pregnant woman, or committing an offense while a child is present. In the case of a second offense, however, the NFL's revised policy states that a player will be "banish[ed] from the NFL; while an individual may petition for reinstatement after one year, there will be no presumption or assurance that the petition will be granted." My disciplinary decision led the public to question our sincerity, our commitment and whether we understood the toll that domestic violence inflicts on so many families. He went on to say that he took "responsibility both for the decision and for ensuring that our actions in the future properly reflect our values." This comes as a major surprise considering Goodell defended his decision at the beginning of August, saying, "...it’s a first offense, someone who’s had a strong background of being very responsible in the community, doing the right things." As such, this major revision certainly represents a step in the right direction, especially in light of the NFL's history of domestic violence. A detailed analysis by FiveThirtyEight revealed that while NFL players, as a whole, are arrested at a much lower rate than the national average, there are certain offenses that are particularly common across the board. Want to take a wild guess at which one tops the chart? Although an aggregate of the arrest rate for all offenses represents only 13 percent of the national average for men between the ages of 25 and 29, the rate of domestic abuse arrests comes closer, at 55.4 percent, and is the number one reason for arrest amongst players. In fact, there have been 83 domestic violence arrests since the beginning of the data's collection in 2000. And while 83 over the course of 14 years might not seem like very many, it still works out to nearly six per year. Even one is too many. The six-game first offense policy would mean that a player would miss nearly an entire half season, as a total of 16 games are typically played. But it is the banishment clause that is turning heads and drawing significant attention. As progressive as this move by the NFL is, many have noted that there is a considerable caveat to the rule — after only one year, a player can petition to be reinstated. While the policy further notes that there is no guarantee that such a petition would actually result in a player's re-admittance to the NFL, it does leave a door in very, very plain sight. And for many, the mere existence of this window of opportunity is too much. Domestic violence is estimated to affect one in four women during the course of their lifetimes, and the Center for Disease Control and Prevention posits that 1.3 million women are victims of domestic abuse every year. Like sexual assault, domestic violence often goes unreported, and more often than not, women suffer this violence at the hands of close family members or friends. Moreover, whereas the NFL is essentially exclusively male, the Bureau of Justice Statistics reports that 85 percent of domestic abuse victims are female, creating an even further gender-divided atmosphere in an already male-dominated sports industry. In his statement, Goodell remarked, "Simply put, we have to do better. And we will." And he has made good on his promise — this new policy is better. But it isn't perfect, and the NFL will have to continue to do better until domestic violence is, once and for all, deemed absolutely unacceptable.